There is one profoundly profound bit of dialog in Noah, the new “Biblical” (I put that in quotes because, well, there have been some complaints about just how Biblical it really is, so, you know, don’t want to make the Big Guy upstairs angry cause, let’s face it, after seeing this movie, one thing is clear, when he gets mad, he gets pissed, know what I mean?…anyway), the new “Biblical” epic from writers Ari Handel and Darren Aronofsky, the latter of whom also directed. At one point, Noah seems to really lose it and starts planning some rather terrifying and somewhat shocking actions that most people would suggest are not of the most Godly kind, to say the least. His middle son, Ham, states that he thought God chose Noah because Noah was good. Noah’s response is, no, God chose him because he could get the job done. That’s actually a rather intriguing theological point. Unfortunately, it’s about the only intriguing aspect of the movie as a whole. Noah is a big, sweeping, over the top, ambitious, with a cast of CGI’d thousands, Ben Hur of a movie. It’s also about as sincere and dull as a Sunday School class. You all know the story. The world is evil. God wants to start over. He chooses Noah to build an ark and take his family and two by two animals into it while God destroys mankind by making it rain for forty days and forty nights, yadda, yadda, yadda. In other words, God’s like Keanu Reeves in the remake of The Day the Earth Stood Still, but with more personality. Handel and Aronofsky have tweaked the story a bit (to be generous). In their version, the world is being destroyed by what passes as greedy corporations of the time, mining the earth for some sort of magical ore while destroying all the plant life by strip mining and fracking (well, that last is sort of my interpretation, but c’mon, that’s really what’s going on here) while eating up all the animals until you’re lucky if you see strange wolf like creatures with scales once every two weeks. So, yeah, it’s a metaphor, or a parable, or whatever sort of literary conceit you want to attribute to it. Not a subtle one, perhaps, but still, it is trying to make a serious point about our times. And, boy, does Aronofsky take it all seriously. As seriously as God. There’s nary a laugh in the whole serious thing. In fact, it’s so serious you end up not being able to take it remotely seriously. Handel and Aronofsky work very hard at it, but, unfortunately, they can never quite create a real emotional connection between the audience and what is happening on screen. The story never feels felt first hand and the characters are all too distant and not quite accessible enough. It all falls more than a bit flat, even scenes like the ones where the animals start arriving in huge groups—these moments should probably sore and pierce the heart of the viewer—but they just never come to life. And the world that Noah and his family live in feels even less realistic than the one in that other apocalyptic film The Road. In Noah’s world, there is no plant or animal life worth mentioning; the world is pretty much barren; and it never rains (until, well, you know). Yet somehow, all the characters are so hale and hearty you think there has to be a gym just around the next rock formation; they dress in tailored clothes with designs that DKNY would envy (before the invention of modern needles); have perfect teeth; and seem to be able to visit the barber and beauty salon on a regular basis (One Million Year BC anyone?). How? I guess it’s a miracle, just like the flood. As was said, Handel and Aronofsky bring their own ideas to the story and depart the original in quite significant ways at times. Fair enough. But what is surprising, even paradoxical or ironical, or whatever, is that for all the departures they make, their contributions never really feel that original or creative. And then the story takes some odd turns. Noah callously lets someone die and then once on board that ark he comes to believe that his mission is not to save mankind, but to make sure that humanity dies out while the animals repopulate the earth. This latter leads to some mind boggling actions on the part of Noah that are more confusing that intriguing. 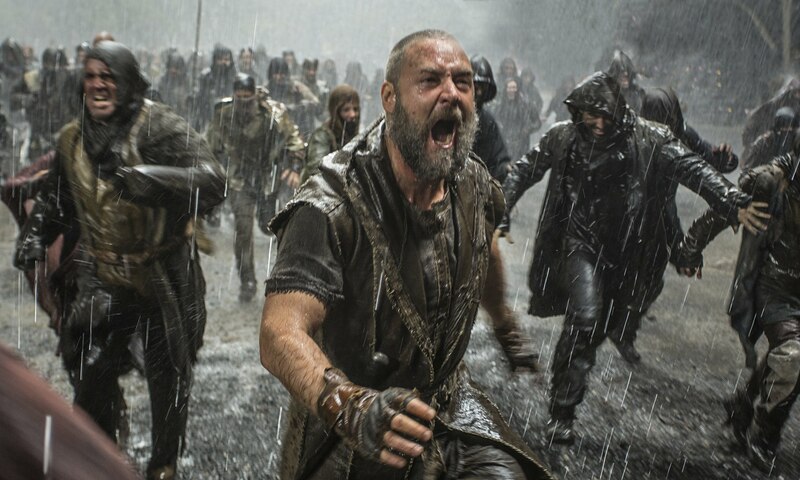 The problem is that the screenplay never makes it clear whether Noah is actually acting under the orders of a vengeful and angry God or whether he is just plain, stark raving mad. And it does make a difference when it comes to how you feel about how the plot plays out. It makes a huge difference if he’s going to commit infanticide because he’s mad and then comes to his senses and changes his mind, or if God ordered him to do the deed (like Abraham), and he comes to his senses and decides to defy the Creator (as the Big Guy is ironically called here). And then there’s that final fight at the end with Tubal-Cain who stows away. I also wasn’t quite sure what to make of that. But here I have to admit that Handel and Aronofsky are a little stuck. Once the flood comes and Noah, his family and the animals are safe, the story’s basically over. Everything after that is denouement and anti-climax. So I’m sure they felt they had to do something to keep the tension up, even if it never really feels like it’s all of one with the first half and that the authors are floundering, like the ark itself. In fact, most of what happens après moi, le déluge feels like it’s just muddying the waters (pardon the pun) of what the authors were trying to say before. The cast consists of Russell Crowe (Noah, natch); Anthony Hopkins (Methuselah); Nick Nolte (Samyaza); Jennifer Connelly (Naameh) and Ray Winstone (Tubal-cain), with Emma Watson, Logan Lerman, Douglas Booth and Leo McHugh Carroll as the kids. Okay, so it’s not quite the star wattage of a movie like The Greatest Story Ever Told (or even Harry Potter). But they all toil by the sweat of their brows (to be Biblical about it) to bring something to their roles and they all have their moments, even though there’s only so much they can do. With special effects also by a cast of thousands. They’re not unimpressive, though I guess I’ve gotten a bit jaded lately and also can’t say that they are particularly impressive either.